In caring for our beloved horses it is a no brainer to have an emergency response plan in place. The Just-in-Case First Aid Kit is made up of a range of 8 products that are essential for any herbal first aid kit. Each kit comes with colour laminated information charts demonstrating uses of the products and how to read the vital signs. Arnica montana 6 X For first aid treatment of bruises, sore muscles, bumps, sprains & strains. VF formula of Organic Aloe Vera Gel blended with Comfrey & Witchhazel extracts, Rosemary Essential Oil & Wheat Germ Oil. To assist in protecting swellings on muscles, legs & body from further inflammation, bruising and swelling. Hand made by infusing organic Calendula petals & Hypericum flowers into organic olive oil, then blended with beeswax & Garlic essential Oil. To be used as a physical barrier protecting skin irritation, abrasions and wounds against flies, contamination and infections. 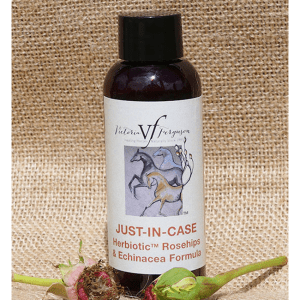 VF formula of Aussie grown organic herbal extracts of Rosehips, Echinacea & Garlic, for first aid treatment whenever infection threatens. 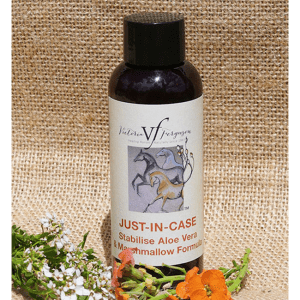 VF formula of Aussie grown organic herbal extracts of Aloe Vera, Agrimony & Marshmallow for first aid treatment of digestive disturbances associated with very loose manure. 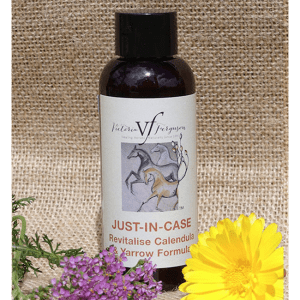 VF formula of Aussie grown organic herbal extracts of Calendula & Yarrow – for first aid treatment of wounds to cleanse and protect from infection and bleeding. For external use. 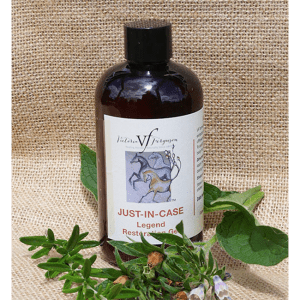 VF formula of Aussie grown organic herbal extracts of Meadowsweet & imported Devil’s claw root – for first aid treatment to assist in protecting swellings on muscles, legs, hooves, and body from further inflammation, bruising and swelling. VF formula of Aussie grown organic herbal extracts of Chamomile, Valerian & Peppermint – for first aid treatment of digestive disturbances associated with discomfort and reduced manure output. See more uses for this product under Reviews. We use no artificial chemicals on our farm and Victoria assists us with animal health, vitality and nutrition. 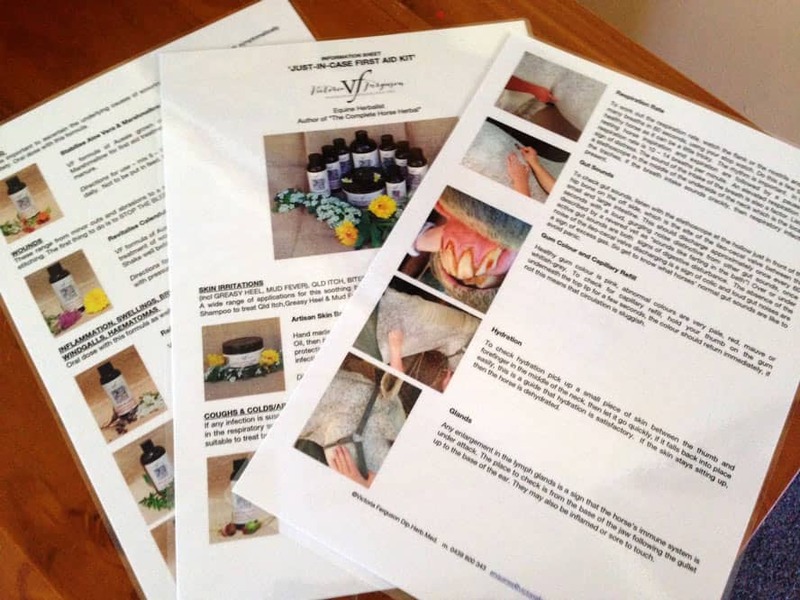 We asked her to make a specialised First Aid Kit for our livestock and have found it incredibly useful and effective. 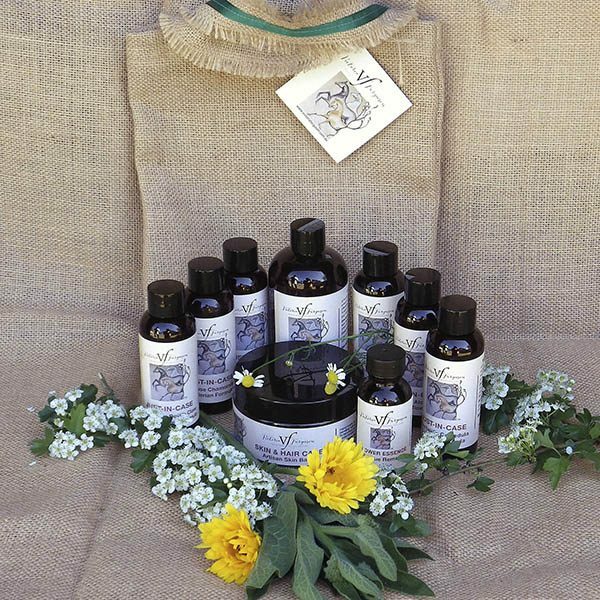 We love the fact the remedies are made from herbs organically grown in Australia. The first aid kit is indispensable and I am consistently able to reach for a natural healing treatment for my horses when a problem arises. The treatments also allow you to get in early and often prevent a small problem from becoming a disaster. Once you incorporate the first aid kit into your stable, you and your horses will never look back!! !